Generally, I’m a summertime and sunshine kind of girl. But I have to admit there are a few things about winter that I like. Skiing is at the top of the list. I smile, or maybe grimace, when I think about some of my ski outfits from years past. As a pre-teen in the late eighties/early nineties, I loved my neon pink Columbia jacket that reversed to electric blue. I even had neon pink goggles to match. Then there was my shiny purple Nevica jacket with its gimmicky avalanche alarm stitched into the shoulder–just what every fourteen-year-old ski bunny needs. In high school I rocked a very aprés look, with an iridescent blue Nils jacket identical to this one, with tight black wool stirrup pants, which I still insist were awesome and would wear today if they fit me. Maybe someday I will post some of my many looks of ski seasons past, if I can find pictures. 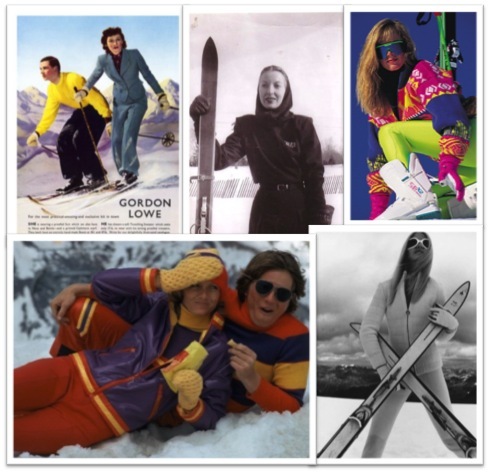 Until then, I give you this collage of vintage ski wear. Skiing in a pantsuit! So awesome.